Natural gas has had a terrific run over the past seven months. [ad#Google Adsense 336×280-IA]From early January through early March, the price of natural gas plunged 34%. The beaten-down sector was extremely oversold, so I suggested taking advantage of the situation. Since then, the price of natural gas has doubled. But it’s now time to get out of this trade. When I showed you this chart back in March, the price of natural gas had been in a steep decline. It had fallen to $1.62 per million British thermal units (MMBtu) – the lowest price in 17 years. But at the time, I noticed the positive divergence on the moving average convergence divergence (MACD) momentum indicator. In other words, as the price of natural gas fell to a new low, the MACD indicator held above its previous low. This sort of action tells us that the momentum behind the decline is fading. And it’s often an early warning sign of an impending price reversal. Since it bottomed on March 3, the price of natural gas has doubled to more than $3.20 per MMBtu. If you bought shares of the United States Natural Gas Fund (UNG) on my recommendation in March, you’re up more than 50% on the trade. Now, it’s time to sell. In fact, aggressive traders should consider selling short shares of UNG at this level. Take another look at the chart of natural gas. At $3.24 per MMBtu, natural gas is trading at its highest price in almost two years. 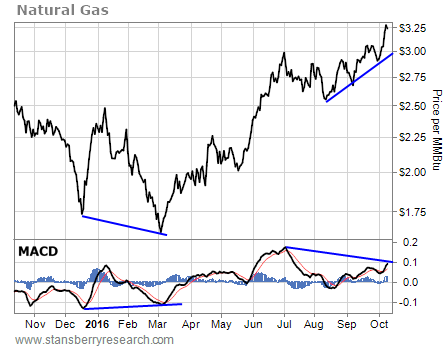 But over the past few months, as the price of natural gas has made higher highs, the MACD indicator has remained below its previous high. This is called “negative divergence.” It tells us the momentum behind the rally is fading. And it’s often an early warning sign of an impending decline. This is the opposite condition from what we saw back in March. So if you bought UNG on my recommendation back then, it’s time to get out of the trade. Take your profits now. Natural gas has enjoyed a terrific rally. But it now looks like that’s coming to an end.